An owner operator is someone who owns and operates their own truck. There are two main types of owner operators. Leased Owner Operators. These owner operators often work for another company under their own operating authority. They own their own truck, and the company they work for helps them find loads to haul. Leased owner operators can only haul loads for the company they are leased to. Independent Owner Operators. An independent owner operator works as their own trucking company. This means they have their own operating authority, find their own loads to haul, and can even choose their own routes and schedule, they are in complete control. How Do You Become an Independent Owner Operator? Before getting your operating authority, you’ll need to determine how your business is organized. You can choose a format such as an LLC or a corporation. It’s important to pick the right structure, as it can protect your company’s assets. You can learn what each part of the necessary operating authority is in our comprehensive glossary. You have a number of choices when it comes to getting a truck as an owner operator. When purchasing a truck, remember that your truck is a depreciating asset. This means that it loses value the older it gets, even if you do proper maintenance or choose to add upgrades to your truck. You can see more tips on how to choose the right truck below. If you’re hauling loads commercially, not only do you need to insure your truck, you also need to insure the loads you haul. The minimum liability insurance level is usually $750,000. Good insurance is crucial, as it can protect you and your profits. If you’re just starting out, you’ll need to make sure to have enough cash on hand to take into account fuel costs, payment between loads, and basic truck maintenance costs. If you want to learn more about handling your funds, here are a few ways you can avoid cash flow problems as a new trucking company. New companies have to go through a new entrant safety audit as part of the FMCSA’s New Entrant Safety Assurance Program. This is your chance to prove to the FMCSA that your truck follows all safety regulations properly. You can learn more about passing the new entrant safety audit here. It can be hard to navigate all the paperwork necessary to become an owner operator. We offer a new motor carrier authority package that gives you everything you need to get started. If you have any questions about the process don’t hesitate to give the coaches at Progressive Reporting a call. We are happy to answer any questions you have and build a custom plan that meets your needs! If you want to learn more about the process, you can also download our free guide. It walks you through everything you need to get your trucking company started. You can also read more about starting your trucking company here. Are Owner Operators Different From Company Drivers? The skills needed to become an owner operator are relatively the same as a company driver. You may still need a CDL if you aren’t planning on driving a hotshot truck. In order to become a successful owner operator, you’ll need to understand basic truck maintenance and may have to do basic accounting for expenses and income to determine your own salary. Lease-to-Own. Leasing a truck to own later is an easy way to keep starting expenses down. However, there are many deals that could force you to pay more for your truck in the long run, even if your starting payments are lower. Purchase a New Truck. This greatly increases starting costs but keeps maintenance costs lower. A new truck is less likely to break down, and when they do, they are often under warranty, and doing proper maintenance can keep your truck lasting longer. Purchase a Used Truck. A used truck is cheaper to purchase, but may require more maintenance. When picking a truck, do your best to avoid a lemon. Check the vehicle’s papers, the mileage, and even the tire condition to get an idea of how well the truck has been treated in the past, also talk to some people with more experience managing a lot of trucks, they can tell you which makes and models to avoid. If you’re thinking about becoming an owner operator, here are a few tips to make becoming an independent driver easier. I can be hard to get loads that pay well when starting out as an independent owner operator. However, the more experience you get and the more reliable you are at getting the loads on time, the better loads you’ll be able to get. If a load isn’t going to be profitable, don’t take it! As an owner operator you can control your routes and your schedule. If you prefer shorter routes, take shorter routes. If you enjoy living on the road, choose longer routes! Just make sure to get loads there and back to optimize profits. Maximizing your loads is extremely important, if you don’t feel like you have the knowledge, we can hook you up with a dispatcher who can teach you the ropes. 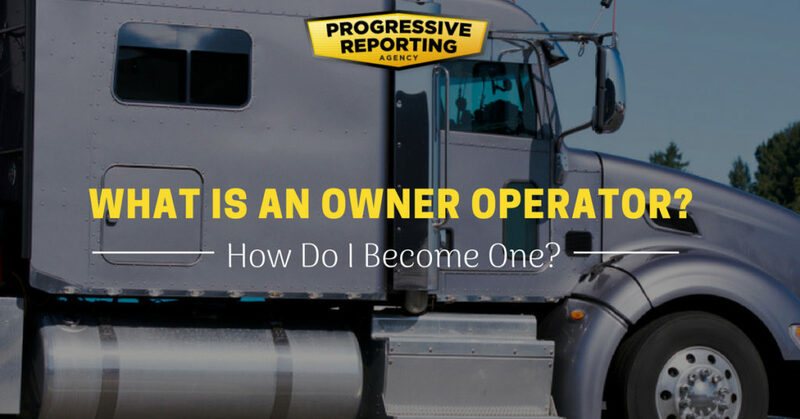 If you have any questions on how to become an owner operator, don’t hesitate to give the coaches at Progressive Reporting a call at (866) 574-2978. We can help you walk through the process of becoming an owner operator and make sure you stay compliant under FMCSA’s regulations so you can avoid unnecessary fees.